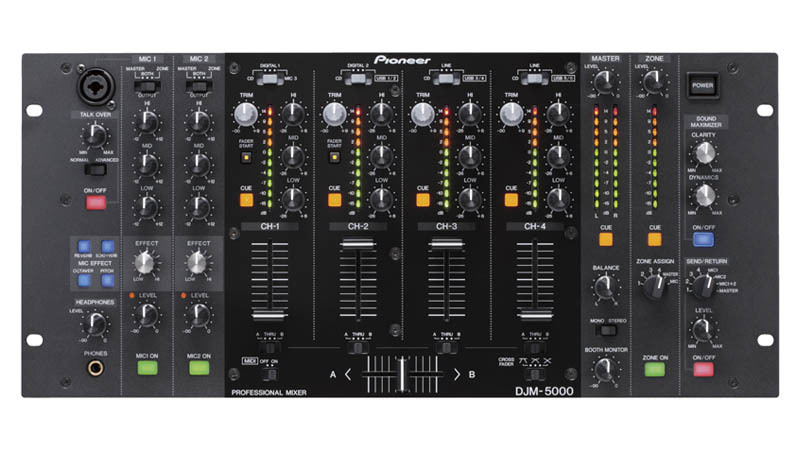 The DJM-5000 features two flexible output modes: multi-zone and standard. In multi-zone mode, the mixer�s outputs can be dedicated to multiple audio sources and distributed to two different areas or rooms. For example, this groundbreaking feature allows DJs to transmit music from a separate source such as an MP3 player to a lounge or cocktail room while simultaneously outputting high energy music from digital turntables to a main dance floor. Similarly, broadcasts from a microphone also can be selected to transmit separately to two different zones, allowing MC performances or announcements to be tailored to the appropriate areas. In standard mode, all four audio outputs are directed to one area such as a main dance floor. The DJM-5000 incorporates another industry first, an exclusive feature called Advanced Talk Over*, which attenuates the frequencies in the mid-range / vocal area of music being played while the microphone is in use. The Advanced Talk Over feature is designed to distinguish announcements made by the DJ and/or MC without lowering the entire volume output, which can often affect the energy of the event. The output of the feature can be adjusted accordingly in two levels through a dedicated control knob on the front panel. The DJM-5000 also includes three microphone inputs, two of which are independent balanced inputs for performances from an MC and/or vocalist. Each microphone channel has a dedicated volume control as well as a 3-band equalizer for increased tonal quality and control. In addition, the microphone section of the mixer is outfitted with four different effects: reverb, echo plus verb, octaver and pitch to further enhance vocal performances. 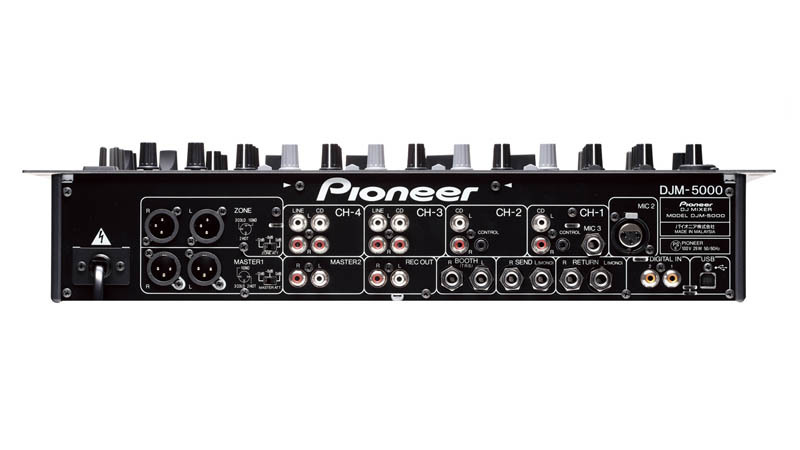 Much like the DJM-1000 and the industry standard DJM-800, Pioneer also enhanced the output of the DJM-5000 by utilizing a 96kHz/24-bit analog to digital converter as well as a 32-bit digital signal processor (DSP) in the mixing process to ensure the highest audio quality output. In order to virtually eliminate interference generated by other products or power cords, the DJM-5000 employs a shorter signal path designed to reduce the effects of inherent noise, a high performance power supply to stabilize voltage, and shielded dual RCA inputs. Furthermore, for entertainers using compressed audio files, the DJM-5000 has been equipped with a built-in audio processor called Sound Maximizer to enhance low and high frequency ranges. The �Dynamics� function boosts sounds in the lower frequency range up to eight decibels for added bass response, which is particularly helpful when the music source is lacking low-end punch. The �Clarity� function adjusts the gain of the mid-high frequency range by up to an additional four decibels for a brighter and clearer overall sound. The clarity adjustment improves the sense of separation and distinction by emphasizing the mid-high range sounds, even at lower volume levels. 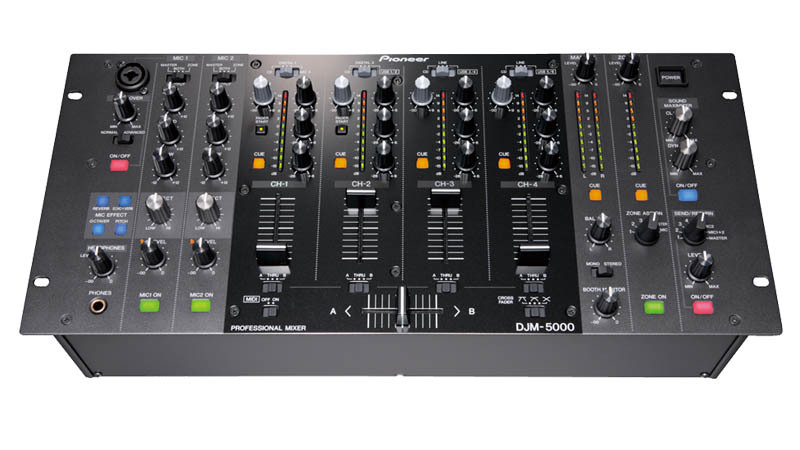 The DJM-5000 is equipped with a six-channel (three stereo pairs) USB Audio Interface. The connection allows direct plug-in from a laptop computer** to the mixer over the USB connection without using an additional external sound card. The mixer is fully functional as a flexible MIDI controller. Sixty-one of the DJM-5000�s seventy-three buttons, knobs and sliders are assignable to transmit control data via MIDI signal to a laptop�s USB port while running any MIDI-compatible DJ software. Digital Input: Two digital inputs allow the user to connect digital sources with digital outputs for the best possible signal quality without deterioration of the content. Peak Level Meter: Each channel features a multi-colored, 10-segment / per channel LED meter to quickly view audio levels at a glance. 3-Band EQ: Equipped with a 3-band (High, Mid, Low) equalizer on each channel, the sound can be adjusted from �26dB to +6dB. Cross Fader Assign: Users can easily assign channel output via the cross fader for increased flexibility. Cross Fader Curve Adjust: Allows the curve of the cross fader to be adjusted to any of three patterns. Fader Start Play: The mixer can automatically start/cue a connected device such as Pioneer�s CDJ or MEP players by simply sliding the cross fader or channel fader. Rack Mount size: The mixer is a 5U by 19 inches wide rack mount size allowing for a variety of rack mount installation applications, ideal for clubs and studios. * Industry first as of August 10, 2009 ** Compatible with Windows and Mac. Three stereo outputs can be assigned under Windows only when used with ASIO compliant software.